Last year I stumbled upon several articles that criticized the idea of promoting happiness in those with chronic illness. They said things like, “don’t tell me sickness is a blessing,” and “stop telling me I can be happy when I am suffering.” It felt like a personal attack, because in creating this site I have tried to take a proactive, positive approach to living with chronic illness. I even threw in smiley faces, flowers, and perhaps a bit too much pink. I wondered for a moment if I missed the boat, that perhaps what women with illness really want is bitterness and anger – a misery loves company approach. There is a saying popular in Zen and Native American traditions “Don’t push the river.” When you experience any emotional state – grief, sadness, or even joy – you must accept the feeling and let it wash over you. Fighting an emotional state only leads to tension in the body and distress in the mind. Similar to struggling against a flowing river, when you resist anything that comes your way, be it a diagnosis or the news of a death, the negative energy only pushes against you with greater force. But, accepting the feeling will help you to release its power. After the acceptance period, if the feeling is still lingering, you can then take action. Here is where a little venting, some tears, perhaps screaming or punching the air can be of great value in ultimately letting it go. 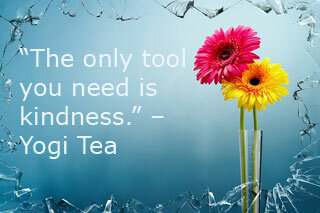 When my Qigong teacher ended our weekly class with a reminder to “use your tools,” I was stunned. At that point I had been aware of Qigong techniques for over a year, yet I had not been making time to practice them regularly. How did she know? She knew through many years of experience watching students learn effective healing tools only to then witness them struggling to use them consistently. I have seen it many times too as a dietitian. Most people know which foods are the healthiest and which make them feel their best; still they gravitate toward the latest diet fad, disregarding their knowledge and inner cues entirely. Often we know exactly what will make us feel better. We have all learned healthy coping mechanisms. Many of these activities are incredibly simple like listening to your favorite song, or taking a short walk in the woods. Still, we tell ourselves that we don’t have time, or that our efforts won’t really help. These are lies. There is always time for taking care of yourself. There has to be, because your well-being is crucial. There is nothing more important than your health and happiness. Nothing! I don’t care if you are a busy parent or the caregiver to your entire family, you have to put your needs first and use whatever means necessary to nurture your own happiness. This may seem a bit redundant, since I just harped on the need for self-care. But, I can’t emphasize this enough when it comes to being happy. I witness so many people living to please others, and I do it myself far too often. Even if your goal in life is to be a great mother, a wonderful friend, a generous citizen, or a doting spouse, you can not sacrifice your own desires and needs without experiencing consequences. Those consequences tend to be illness, depression, anger, and regret. Giving and taking are balancing acts. When we care too much about what others think, or value their time or desires more than we value our own, we end up in an emotional deficit that results in unhappiness. Instead of over committing yourself, or putting your family or friends’ needs over your own, remind yourself that you are a well that needs to be filled. If you keep giving away your water, or you simply allow others to keep taking it, you will run dry. Refill and replenish yourself by making time for the fun activities that you love – reading a book, watching a movie, playing with your pet, calling a friend, playing a video game, or getting a massage. Taking time for any of these things won’t make you selfish or self-indulgent, it will make you happy. 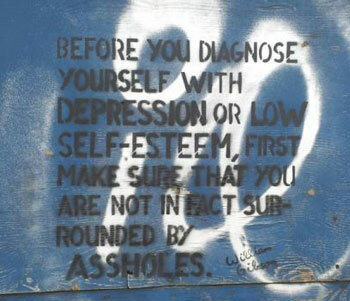 Happiness is a circle. When you are happy, you are more likely to be generous, kind, and loving, which makes you feel even more happy, and often generates more happiness around you. Unhappiness, on the other hand, is a downward spiral that can pull down those around you and ultimately work its way into other negative emotions like guilt or shame. The unhappiness spiral is very powerful, and it is easy to get sucked in if you aren’t careful. Luckily, there is an antidote to all negative emotions. Fear, anger, loss, and sadness can all be eliminated through love. A lot of spiritual advisors and gurus advise us to “fill ourselves with love and light.” After asking a trusted spiritual teacher what I should do to combat anxiety, she told me to focus on filling my spirit with white light and fill my heart with love. At first I nodded my head politely, but before I could stop myself I blurted out, “what does that mean?” She got a good chuckle out of my blunt question. After a long pause, she advised me to do something kind and loving for someone else. Now when I am feeling especially unhappy, stressed, or anxious I send out “love messages.” I have even sent these appreciation-filled notes or e-mails to people who are just acquaintances, like someone I met at a lecture who touched me with their honesty. The simple act of putting my admiration into words is the most basic form of love for me. It just works. It takes me away from my preoccupation and enables me to get excited as I imagine how the recipient will feel when they open their mailbox or inbox. If this is just too sappy for you, you can contain your thoughts of gratitude and love in your own private journal. Write down how much someone’s kindness affected you, and then let that gratitude fill your whole being. When I first got word of the recent passing of my husband’s Grandma, I was working from home, glued to my desk and computer. Although the initial news came with some relief because she had been suffering in the final two weeks of her long life (she lived to 102), as the reality that her gentle presence would no longer touch my physical world, I began to feel a terrible sense of loss. My body became tense as the sadness took hold. Suddenly a beautiful orange Oriole caught my eye flitting about in the garden in my front yard. The rare site ultimately drew me outside. As I walked around the yard, a sense of calm washed over me. The birds were chirping and I felt as though Grandma was with me. She loved to watch the birds too, and that realization helped me feel eternally connected to her. I read an article on LinkedIn recently that discussed the problem of bullying at work. Nothing brings on chronic unhappiness quite like a hostile work environment. I know from experience after enduring abusive bosses and co-workers on many occasions. Even as a communications consultant, I have had clients “throw me under the bus” so to speak when they were getting heat from their boss. It seems like when the pressure is on insecure individuals tend to look for a scapegoat. This is actually true in life in general. There are always unhappy individuals ready to pounce on those they feel are unlikely to retaliate. The LinkedIn article pointed out that in times when we are being victimized what we need most is a boost in confidence. The author recommended contacting a friend or colleague who knows you well and can remind you exactly how great you really are. Keep a list of those people in the ready to call or e-mail when you need that loving reminder. To be even more proactive, keep a folder of complimentary e-mails, cards, or testimonials from people who truly know your worth, and review it when you are feeling low. Never let the words or actions of the loud, obnoxious few drown out the cheers of your loyal, faithful supporters. Laugh long and laugh hard as often as possible. Similar to love, laughter is a proven antidote to sadness. Even just the act of smiling can release positive chemicals in the body making you feel better. Stress expert, Bryan Luke Seaward, Ph.D. encourages the creation of a “tickler file” filled with cartoons, jokes, and mementos that make you smile. Keeping funny movies on hand for when times get tough is another sure-fire remedy for making you feel happier. What do you do when you need a little more happiness in your life?